Glycosylphosphatidylinositols (GPIs) are found in the outer cell membranes of all eukaryotes. GPIs anchor a diverse range of proteins to the surface of Plasmodium falciparum, but may also exist free of protein attachment. In vitro and in vivo studies have established GPIs as likely candidate toxins in malaria, consistent with the prevailing paradigmthat attributes induction of inflammatory cytokines, fever and other pathology to parasite toxins released when schizonts rupture. Although evolutionarily conserved, sufficient structural differences appear to exist that impart upon plasmodial GPIs the ability to activate second messengers in mammalian cells and elicit immune responses. In populations exposed to P. falciparum, the antibody response to purified GPIs is characterised by a predominance of immunoglobulin (Ig)G over IgM and an increase in the prevalence, level and persistence of responses with increasing age. 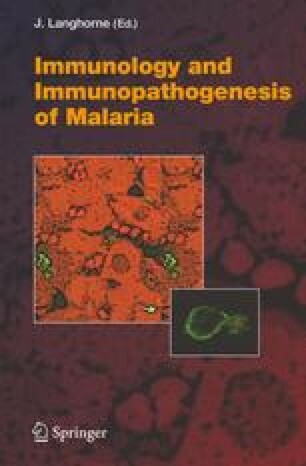 It remains unclear, however, if these antibodies or other cellular responses to GPIs mediate anti-toxic immunity in humans; anti-toxic immunity may comprise either reduction in the severity of disease or maintenance of the malaria-tolerant state (i.e. persistent asymptomatic parasitaemia). P. falciparum GPIs are potentially amenable to specific therapeutic inhibition and vaccination;more needs to be known about their dual roles in malaria pathogenesis and protection for these strategies to succeed.